October 11, 2018 marks the 30 year anniversary of National Coming Out Day. To celebrate, we wanted to share a little about the origins of this holiday, the ways in which it was first celebrated in the Rio Grande Valley, and why so many in the LGBTQ community regard it as important. National Coming Out Day has its roots in the Gay and Lesbian Liberation March of 1987. At the time, it was the peak of the AIDS Crisis. President Ronald Reagan’s administration, however, remained by in large silent about the epidemic. Funding for the research into the virus and care for those affected was notoriously low. In response to this grim scenario and the overwhelming lack of legal protections for gay and lesbian Americans, LGBTQ advocacy groups from across the country were called to participate in a large march on the capitol in Washington, DC. The planning for the march took an entire year but a date was set: October 11, 1987. That day, hundreds of thousands of people (some estimates go as high as 700,000 in attendance) converged on DC to demonstrate, demanding equal treatment for all Americans regardless of sexual orientation as well as an increase in resources allocated to HIV/AIDS programs. The following year, in 1988, openly-gay psychologist Robert Eichberg and lesbian feminist activist Jean O’Leary came up with the idea for a national “coming out” day. They encouraged LGBTQ people to “come out” or to disclose their identities to their loved ones and others. The goal was clear: advancing visibility for the LGBTQ community and furthering support for their rights. It was a unique call to action daringly different what many previous LGBTQ actions had been; it was not a protest against proposed or existing legislation nor was it a call to mass demonstration or civil disobedience. Instead, it was a call focused on harnessing the power that LGBTQ individuals had to make change within their immediate circles through everyday choices and small, personal interactions. Eichberg and O’Leary decided to capture the importance and legacy of the first Gay and Lesbian Liberation March of 1987 by marking the one-year anniversary of the march as the first official National Coming Out Day. That year, National Coming Out Day was celebrated by a few organizations across the United States in several states that year. The first known celebration of National Coming Out Day in the Rio Grande Valley would follow one year later, in 1989. In 1989, VAC was still a brand new organization. It had been established barely one year before in response to the growing AIDS crisis in the Rio Grande Valley. In addition to its virus and education outreach work, the small-staffed organization was also focused on efforts aimed at combating homophobia and stigma with those at highest risk for contracting HIV. Oscar Raul Lopez was one of VAC’s first employees and outreach workers. He remembers organizing the first known Coming Out Day event at Club 440, at the time a brand new “hot spot” gay bar in Brownsville. The weekend before National Coming Out Day, Lopez simply cut out an image from the Advocate magazine, pasted it on a simple flier, and printed it out for mass distribution. The graphic was one by HIV+ queer artist Keith Haring. Originally designed for the first National Coming Out Day, it featured his signature graffiti-inspired figures kicking open a closet door. Underneath the flier printed by Lopez were the words “come out, come out, wherever you are” along with the names of the drag queens who would be performing at Club 440. Lopez distributed these fliers to patrons at 440 and even at McAllen’s Club X, as members of the community were known to often drive from one bar to the other in the same evening. That weekend he also took to the stage encouraging all those at the bar to speak and live their truth. Lopez would leave the Valley for a time shortly thereafter but continued working in HIV/AIDS prevention and advocacy in other parts of the country. 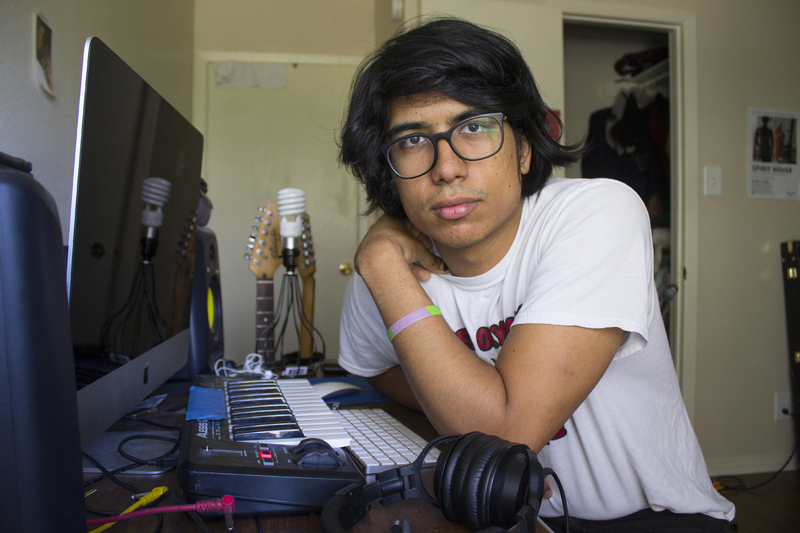 Before leaving, he helped found what would become Valley Voice, the Rio Grande Valley’s first known LGBTQ advocacy group. On October 11, 1991, Valley Voice organized a larger-scale National Coming Out Day celebration. Wanting to show solidarity with LGBTQ people living across the border, Valley Voice members decided to have the event in Matamoros. Alicia Lugo, who was at the time president of Valley Voice and one its main organizers and moderators, still remembers organizing the event: a fancy “Coming Out” dinner. “We went all out…it was filet mignon and fancy wine…the finest,” she told Neta. After that, members got together and went out to celebrate by “dancing the night away” at the Club 440. The following year, Valley Voice began publishing In Touch Magazine, a zine-style publication targeted towards the Valley’s LGBTQ community. The September/October 1992 issue of In Touch was dedicated to National Coming Out Day and featured several different perspectives on the politics and the importance of coming out. “We must destroy these myths once and for all. Shatter them! We must continue to speak out, and most importantly, every gay person must come out! As difficult as it is, you must tell your immediate family. You must tell your friends, if indeed they are your friends. You must tell your neighbors…..and once they realize that we are indeed their children and we are indeed everywhere, every myth, every lie, every innuendo will be destroyed once and for all. And you do, you will feel so much better,” read Milk’s words on the In Touch publication. The same issue also featured a piece related to the issue of coming out written by Frances Marsh (who at the time used the spelling “Phrances” for her writings). Marsh, who at the time was still in high school, wrote a regular column for In Touch called “From the Teen Side.” She used this space to address queer and questioning youth throughout the Valley who might be struggling with their families, schools, and identities. In this particular issue, Marsh directed her column at teens who might not yet be out to their families or to most of their friends. This was an important acknowledgement of the reality of many teens who might not have felt safe to come out to those around them in the conservative social climate of the Valley of the 1990s or who lived with unaccepting families. She pointed out that while coming out could be important to some, there were also several advantages to being in the closet. Marsh says that what she wrote about as a teenager is something she still thinks about regularly. “Obviously, there are so many privileges that hetero people have that queer people don’t, but there are certain advantages that come with being queer and I just wanted people to know about them,” Marsh said. National Coming Out Day continues to be an important day for the LGBTQ community in the Valley and throughout the country, who continue to have conversations about the politics of disclosure. For more on the stories of Valley Voice, In Touch Magazine, Valley AIDS Council, Oscar Lopez, Alicia Lugo, Frances Marsh, Club 440, and what it was like to come out in the Valley in previous decades, check out Pansy Pachanga, a documentary on the history of the Valley’s LGBTQIA+ community coming in 2019. Special thanks to Oscar Raul Lopez, Alicia Lugo, Laurie Coffey, and Frances Marsh for providing the info for this article. All images original from September/October of 1992 issue of In Touch Magazine and provided by Alicia Lugo and Laurie Coffey.